When lawmakers question Acting U.S. Customs and Border Protection Commissioner Kevin McAleenan at his confirmation hearing tomorrow, they should ask him why the agency hasn’t asked for a new border wall in the last ten years. According to President Donald Trump, who made the wall one of his signature campaign-trail promises and ordered DHS to build it in his first Executive Order, such a physical structure is critical to the nation’s security. Funding the wall sits at the top of the long list of immigration policy directives Trump issued earlier this month in exchange for supporting legislation protecting “Dreamers,” or illegal immigrants who were brought to the United States as children. “Our porous southern border presents a clear threat to our national security and public safety,” the document stated. However, Members of Congress from both parties have argued that a new wall is redundant and unneeded. For instance, Representative Will Hurd (R-TX), whose district contains the largest swath of the United States/Mexican border (800 miles in all), pointed out that "building a wall is the most expensive and least effective way to secure the border." To find out, the Project On Government Oversight decided to hit the books. Because the Department of Homeland Security (DHS) undertook a deep analysis of border needs before it built existing fencing under the 2006 Secure Fence Act, we knew that if the agency wanted a wall, a request should have appeared in one of the budget justifications, risk analyses, or strategic plans DHS churns out every year. However, neither DHS nor the U.S. Customs and Border Protection (CBP)—the lead agency responsible for securing the border—has requested funding for new walls or fences over the last decade. CBP generally gets its border security funding via appropriations and immigration reform bills. Before appropriations bills are put together, federal agencies send budget requests to Congress along with extensive justifications explaining how they plan to spend the money. CBP’s budget justifications dating back to 2007 contain no requests for new walls and fences (called “tactical infrastructure” in CBP bureaucratese), only funding for existing fence maintenance. Strategic documents also notably lack recommendations for new walls or fences. CBP has long said that tactical infrastructure is important to border security, but has always maintained that it’s just one part of the “layered approach” necessary to secure the border, along with patrol officers and technology such as drones, sensors, and cameras. This layered approach is outlined in strategic plans like the Quadrennial Homeland Security Review, a report mandated by the 9/11 Commission Act of 2007 to make “recommendations regarding the long-term strategy and priorities of the Nation for homeland security.” The most recent edition of this review incorporates several risk management analyses, none of which recommend additional border infrastructure. If anyone should know whether a new wall is needed, it’s CBP. Sadly, the agency hasn’t measured how the nearly 700 miles of fencing already sitting on our southwestern border contribute to border security. That was the conclusion of a February 2017 report by the Government Accountability Office (GAO), conducted at the request of seven Members of Congress, including the chairs and ranking members of the House and Senate homeland security committees. Two of the requesting members, Senator John Cornyn (R-TX) and Representative Michael McCaul (R-TX), are sponsoring concurrent bills that would provide the money to build the wall. The report also found that the Requirements Management Process, a program established in 2014 to assess CBP’s border security needs, was underutilized because officers weren’t clear on their roles and responsibilities under it. One of the program’s steps includes the Capabilities Gap Analysis Process, which requires each border patrol station to assess the difference between threats and the station’s capabilities to meet them, then recommend solutions to address any gaps. GAO found that CBP can’t determine whether it needs more fencing or walls because it hasn’t assessed how and why such barriers contribute to its operations—a necessary precursor to asking for more. The report also points out that CBP is already looking at spending many years and millions of dollars to maintain the existing barriers, suggesting that more infrastructure could burden the agency unnecessarily. Meanwhile, DHS has already spent nearly $3 billion to build six prototypes of 30-foot-high walls to Trump’s specifications. Before Congress greenlights more huge sums of money to expand these walls across the border, it should at minimum learn how existing barriers contribute to security. Congress has always demanded justification for the money it spends; indeed, it’s Congress’s responsibility to provide oversight of executive branch spending. 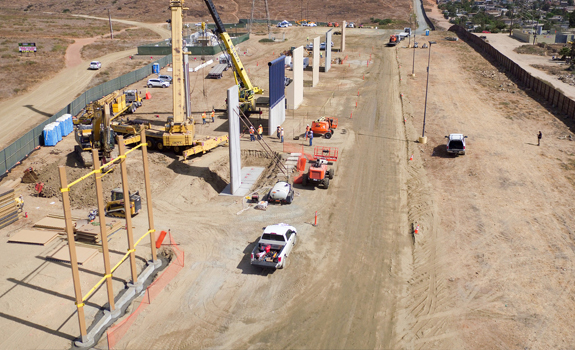 If DHS can’t adequately justify more border infrastructure, this project should hit a wall. This blog initially reported that the Department of Homeland Security had already spent nearly $3 million to build six prototypes of the walls. This has been changed to the correct amount of $3 billion.